With Preceden's presentation mode feature, you can easily present your timeline to a group of people. The only problem is that while you're viewing your timeline in Preceden, you can see the navigation links and the various other elements on the page that let you work with your timeline. If you're presenting your timeline to an audience, chances are you don't want all of that visible. You could download your timeline as an image and add it to a PowerPoint presentation, but if your timeline has a lot of content, you'll need to shrink it which may distort the content and make it difficult to read. 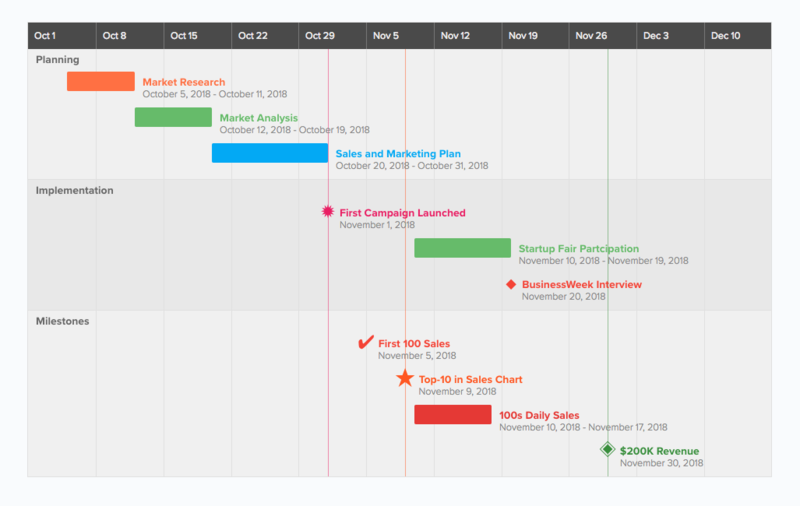 Presentation Mode solves these issues by letting you present just your timeline from directly within Preceden. To access it, simply click the Present button below your timeline. Voila! Now it will just show your timeline. The only other thing you may want to do is enter full screen mode in your browser to hide the browser window. You'll find this option under View > Enter Full Screen Mode or something similar depending on which browser you're using. When you're done click anywhere on the page or press the escape key to return to the normal editor. In the future we may add more advanced functionality such as automatic scrolling or clicking to show timeline events one at a time. If either of these interest you or you have any other ideas for improving it, don't hesitate to reach out: help@preceden.com.